The perfect mascara! Forms water-resistant beauty tubes around lashes. Adds volume and length. Cannot clump, run or smudge. Fewer ingredients make it lighter on lashes. Can be used on lash extensions. Lasts longer without drying out in the bottle. Stays on while sweating, crying or rubbing your eyes. Leaves no tint or residue buildup on lashes. Does not come off with oily skin. Ideal for sensitive eyes and contact lens wearers. Does not require rubbing or make-up removers. 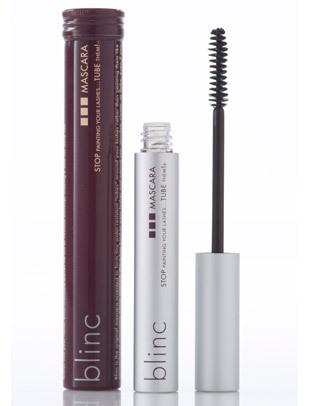 Like we said, the perfect mascara! Apply Blinc like a regular mascara. It is important that you do not use conditioners, lotions, etc... before applying the mascara as Blinc requires a dry, clean surface to adhere properly to your lashes. It takes Blinc about 2 minutes to set and begin forming the tiny "tubes" around the lashes. Do not let it set before applying another coat! You have 2 minutes to build your coats until satisfied with the volume, length and degree of lash separation. Once it sets, you can no longer build. Only when you are ready, Blinc can easily be removed with a combination of warm water and gentle pressure. Pressure alone is not enough, and water alone is not enough. It must be a combination of both. We like to remove in the shower! Tiny tubes effortlessly slide off your lashes and can actually be seen in your hand. Tip: If you love Blinc's performance but occasionally use another mascara for a different look, try applying Blinc over the other mascara to "tubify" and seal it with unparalleled staying power!